The famous fashion house of “Pronovias” has launched a range of trendy bright colors of the fashionable evening gowns for weddings and engagements, which are dominated by the nature of femininity and youthful of brilliance and fascination color . · The latest collection included a number of the latest soft and classic cuts at the same time in order to keep up with the stylish colors and some pastel colors with quiet degrees to give a wonderful versatile and colorful choice for the bride. · Magic stunning femininity represented in the long bright dresses and sequined entirely with sequin of breathtaking and refined design . 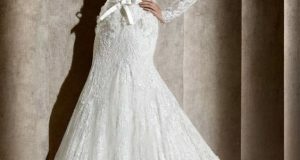 · Dresses collected between narrow and broad cuts in luxury styles , and the most unique dresses that adorn the back with lace cloth and bright crystal . · Some dresses were designed with loose top and narrow skirt in stylish and elegant designs that fits the modern lady. · The colors of theses dresses have varied between bold and bright and pastel colors , with the degree of blue, pink , phosphor green and red , purple, these dresses were focused on the character of the elegant seduction through a very feminine style, which the dresses highlights carved body.